September of 2015 is another month of only 2 TFs. 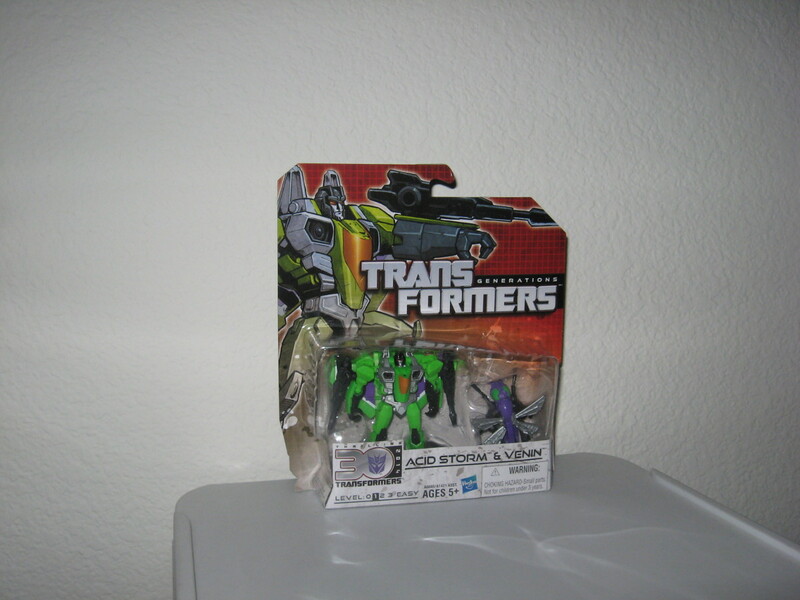 Acid Storm is yet another repaint of the legend class Seeker mold. As if having Starscream, Thundercracker, and Skywarp is not already enough. I could have easily passed on Acid Storm (and you should too if you’re on the fence about buying), but at about $8 I figured why not. Plus I never saw him in store before. I got this through Amazon, but it was a 3rd party seller. The seller was The Chosen Prime. This was my only experience with them. I have heard good things about them, but to this day I have not ever made a direct order. I’m gonna have to try them soon. Anyway, Acid Storm does not feel as sturdy as the others Seekers of this mold. I guess they used the mold one too many times. 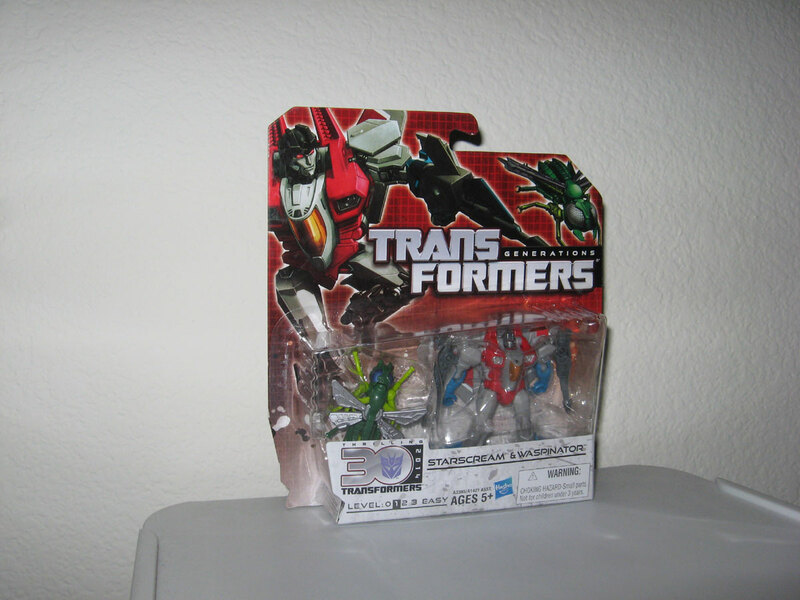 Venin is an exact of repaint of Waspinator that came with Starscream. I have said before that Arcee and Chromia are the last of the Thrilling 30 figs. I totally forgot about Acid Storm. He really is the last of the Thrililng 30. And now as I write this, I realize he’s packaged a bit different from Starscream. Weird. Compare pics here and here. The only other purchase this month is Megatronus from Robots in Disguise. Megatronus is definitely one of the better figures from RiD. His robot mode and alt mode looks good. Transformation is fun. Hasbro managed to make him feel solid and robust despite the cheap plastic. His joints are the right amount of tightness for some nice poses. I got here the Toys R Us exclusive version, which hit stores first. This version has the head of Megatronus in some kind of battle helmet. A mass retail version would come out later (which I also have). Overall I highly recommend this figure. I think he’s my 2nd favorite of the RiD figs, right behind Drift. Below are some pics of the 2 figs. 2 figs last month, and 2 figs this month. That is very unlike me. But there was a good reason. I went to Europe at the end of September of 2015. I will make a post soon about my TF hunting experience there, much like I did for when I went to Shanghai. Til next time… Transform and Roll Out! August of 2015 continues with Combiner Wars. Both figs this month come from CW, though neither one realistically combines. More on that later. 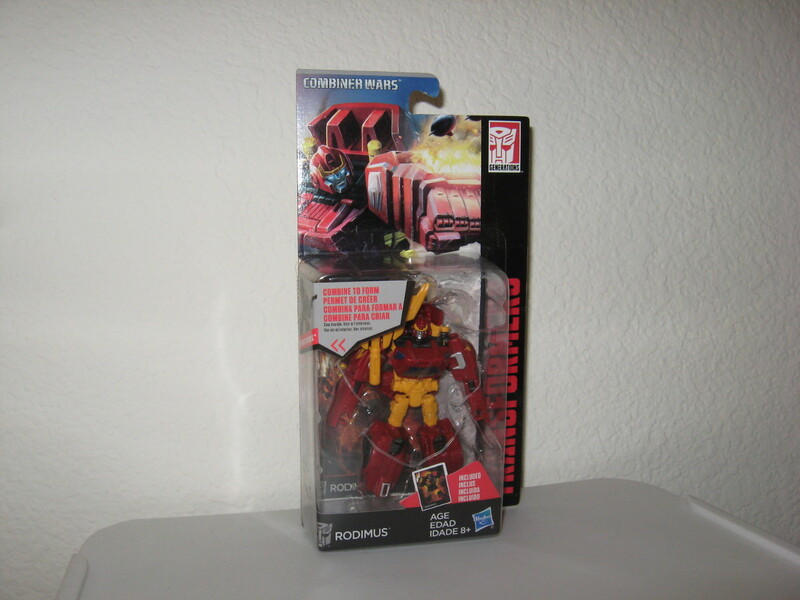 CW legend class Rodimus is a repaint of Blackjack, with your classic Hot Rod color scheme and a new head mold. Technically he does combine to be the chest plate, when Optimus or Motormaster is used as the body component. But this feature feels tacked-on like an afterthought or gimmick. I mentioned before that Blackjack has got some poorly fitted connection ports when trying to be attached as the chest plate, and Rodimus shares this same problem. Shame to see that Hasbro did not fix this. The weapon/wing accessory has a right place when Rodimus is in alt mode or chest plate mode. But in robot mode he can only hold the weapon, and not have them attached to his back as wings to have that classic Hot Rod look. For Blackjack this is a non-issue, but I expected more for Rodimus. I can only recommend this figure if you’re a completist or if you are dying of TF thirst. Pass otherwise. 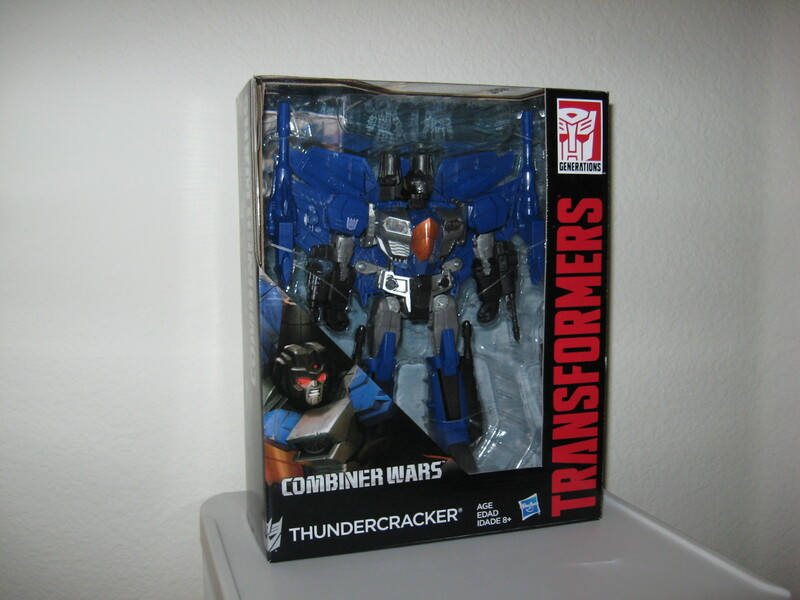 This is the 2nd Thundercracker to be released in the CW line. The first one was a legend size figure. This figure is Leader class, and he is a minor rework of the awesome Jetfire from Generations Thrilling 30. I like this figure. He feels different enough from Jetfire to warrant a re-release of this mold. In addition to the different color scheme and head mold, Thundercracker has a different chest mold, different shoulder molds, and differently styled wings that resemble more like an F-15. He also has extra twin guns for the wings, instead of the the Jetfire thrusters pack. I love the sleek blue jet that is Thundercracker in alt mode. The one knock against this figure is the size. At Leader class, Thundercracker is the same size as Ultra Magnus, Megatron, and Jetfire, and that is just is too big to scale well with the rest of your CHUG lineup. A Voyager class Seeker mold would work better here, such as Cyber Battalion Starscream. August was a light month in terms of TFs. More will come soon… Transform and Roll Out.